ZUCCHINI FRITTERS: After perusing several recipes this afternoon, I decided to make up my own zucchini fritter recipe and it came out darned good. Usual directions about salting the zucchini and leaving it set in a colander for 10-20 minutes apply. I used my potato ricer to squeeze out the juice right into a bubbling pot of veggies that I later turned into a zucchini-golden chanterelle bisque. Add enough water until it starts to resemble a thick batter instead of a dough, then mix in the zucchini and veggies. Stir in more water until it reaches a consistency that will form nice 1/4 cup globs that you can pat flat on the frying pan with your fingers. Brown on both sides until done. 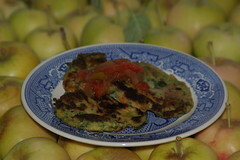 Eat with some delicious Pottsfield Relish* or chutney or fresh salsa. Maybe an almond-lemon pesto. ZUCCHINI (Golden Chanterelle) BISQUE: I had a monster zuke from the new friend who has opened her yard to my foraging for apricots, green gage plums and apples. Big zukes are good for zucchini bread, fritters and bisque. If you did not know, a bisque is a soup that uses rice (and potatoes, sometimes) to create a nice creamy, starchy consistency. No dairy, cheese or bizarre thickeners required, I swear. Cook up 1/4 c. of arborio rice and let sit in the hot water. In the dutch oven, heat enough water or vegetable broth to cover the veggies (start low and add more once the veggies are done sauteeing). I added 1 packet of dry sauteed, sliced golden chanterelles and about 1 c. of golden chanterelle broth to the pot. Once the water is hot, add the rice, too - what the heck. Also added 1 T crushed black pepper. Don't add any salt yet -- remember, you added miso! After adding the softened veggies to the pot of broth, I added about 3 T of miso, along with 1/3 c fresh parsley leaves, some fresh oregano and thyme. I let everything cook until it was very soft. Cool the veggies and broth. Process in blender or food processor. At this point, I pulled out two more 8 oz (before dry sauteeing) baggies of chopped golden chanterelle and let them defrost in the bisque. It tastes pretty good -- I will let it cool and check the seasoning tomorrow when I heat it up. This bisque will be great to freeze in individual portions for lunch! PLUMS: James pitted most of the plums -- I had to stop him so we'd still have some to snack! Even then, we were plucking plums out of the pot as they warmed up, these are the tastiest plums we've ever had. The plums are resting - skins and meat - I am going to strain some and just make jam out of the meat tomorrow. I think I may pull out plum skins with tongs if it is easy enough, otherwise I will just leave the in. APPLES: Apple sauce requires a lot more peeling and paring than I think I have time this week. I now have a whole big milk crate of apple from my friend Lawrence -- when I called to check on our morning carpool he said, "I have a surprise for you - you're going to hate me!" So, I have apples from Larissa's house on Sunday - light yellow, and a crate full of tart green beauties (much bigger) from Lawrence's place in Danville. I'm thinking I should make some canned apple pie filling -- he had told me he was going to make a rum raisin apple pie, so I think I should make at least one batch of rum raisin apple pie filling. I can leave on the peels and just slice up the cored apples, cover them with the syrup/batter and hot water process them. Any other ideas on what to do with apples and limited appendages and waking hours? APRICOTS: While the plum jam is cooking tomorrow, I may focus on the apricots since they'll go off earlier than the apples. I wish the solar dehydrator was done! Hoping my brother will finish it off on Tuesday, then I can do some dried apples! *Recipe for Pottsfield Relish coming soon. I promise. I just opened my last jar in anticipation of a bumper tomato crop. I swear - pictures are coming soon for everything! How about breaking out your new juicer for the apples? It still takes some time but maybe not as long as pie or sauce.